Start working on the built-in whiteboard right away — just switch on the display. Intuitive operation makes life easy for kids and less tech-savvy presenters. * In some cases, files may not be viewable even if they are encoded in a supported format. You can write and draw on almost any media you like, including video and still images from external devices. These dynamic multi-media capabilities make it easy for teams to share information, contribute ideas, and solve problems. Note: Drawing on media transmitted via Mirroring Input is not supported. *1: With built-in memory setting to ON. When individual file data size is large, the number of pages that can be saved may decrease. *2: Built-in memory ON/OFF is included. When OFF is selected, only one whiteboard page can be created. *3 Can be sent as JPEG format only. BF1 Series displays feature a pair of built-in 20 W [10 W + 10 W] speakers for clear and powerful audio playback. Switch on. Start work. Make notes, draw, add graphics, display documents, video, and more. Save as image files and email. Couldn't be simpler! 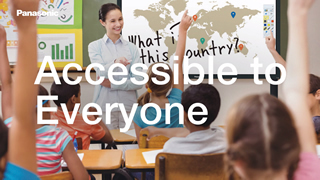 Precise 12-point multi-touch control and user-friendly menu bar make it easier for students to understand any subject using the display's powerful features. The BF1 Series not only lets your teams videoconference*, it allows them to work on documents together in split-screen mode at the same time. * Additional equipment and subscription required for video- and web-conferencing system. 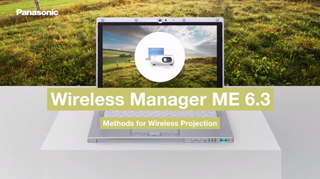 Media such as websites, documents, and PC desktops can be mirrored wirelessly* from compatible devices on the big screen. The BF1 Series has useful application in industry. Staff can manage production processes, scheduling, and share spreadsheet data on-screen. Connected to appropriate PC software, the BF1 Series excels as an interactive touch-screen display for museums, exhibitions, and more. 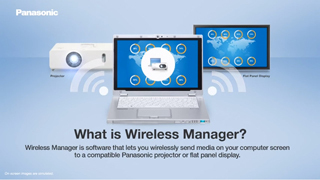 Panasonic's Wireless Display function supports secure high-bandwidth wireless transmission from compatible Windows® PCs. 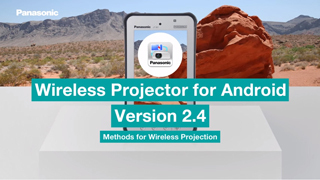 Panasonic apps for Windows®, Mac, iOS, and Android™ add a raft of extra easy-to-use functions including Multi-Live Mode in split-screen. Thank you, first of all, for your continued patronage of our products. Please be advised that Intel has announced that they will cease support for their Intel® WiDi and Intel® Pro WiDi products. Unfortunately, this means that we also will need to discontinue support for the use of Intel® WiDi and Intel® Pro WiDi functions in our products. From now on, we recommend that you use Miracast, which is supported as a standard function in Windows 8.1 or later computers. * Please be aware that Miracast cannot be used on some computers. If you are unsure of compatibility, please consult your computer manufacturer prior to purchase. For more information, please visit the Intel Corporation. * Drawing on media transmitted via Mirroring Input is not supported. 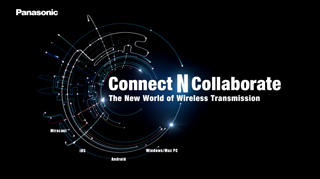 Still images, video, and audio are all smoothly transmitted peer-to-peer from Windows® PCs and Android™ devices. Video content is supported at up to 1080p resolution, with high-bandwidth performance ensuring stutter-free video playback. Display modes comprising Duplicate, Extend, and Second Screen allow your source device screen and the display to interact in different ways depending on your needs in the meeting space or classroom. A PIN code appears when a user attempts to connect to the display. Only those with access can transmit wirelessly, preventing improper or accidental use. The Wireless Display feature is optimized to ensure smooth and uninterrupted playback of online streaming video sources, adding another layer of versatility and convenience. Selectable 2.4 GHz and 5 GHz* channels for areas with Wi-Fi® congestion are included. Download free via App Store (iOS) or Google Play (Android™). 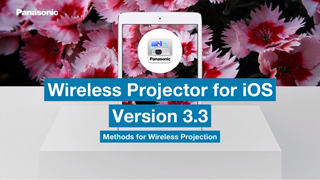 Search for "wireless projector". * This optional product can be purchased in the U.S., Canada, Japan, Australia, and New Zealand. Use a VGA cable to mirror content* on a second display or projector — even the notes you might add to documents, images, or video during your presentation. This dual-display capability makes the BF1 series ideal for use in larger venues. 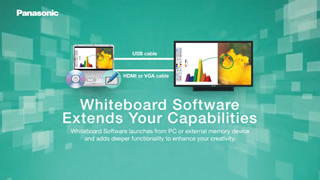 Supported inputs include HDMI, DVI, PC, Memory Viewer, and Whiteboard. Picture-in-Picture functions offer the versatility to display images from two input sources on the same screen. Documents, videos, and stills can be displayed full-screen with a sub-window showing content from a different source. Ideal for web conferencing, you can display meeting documents on the main screen and live video footage from a remote location in the sub-window. Display media in a window on the whiteboard interface and make notes on the blank space surrounding it. Note: Writing and drawing on sub-screen in not available. Miracast and Memory Viewer do not support Picture-in-Picture capability. SLOT2.0 allows you to add the connection terminals needed for specific applications. Optional function boards can be inserted to support a customized content distribution system. LAN terminal is compatible with Crestron Connected™ automation and control software. Monitor and control display devices in your network remotely from a single PC via Ethernet. Compliance with PJLink™ Class 1 enables remote control and monitoring within a wider AV network of PJLink™ — compatible components of any brand. Incorporating these displays into an existing system via the local network is seamless and cost effective. The use of Color Universal Design improves visibility regardless of individual differences in color perception. This design gently relays correct information to people with various color-viewing conditions. What is Color Universal Design (CUD)? Due to genetic characteristics or other vision disorders, people can perceive colors differently. Some individuals can have difficulty distinguishing between certain color combinations. CUD ensures that color information is accurately expressed for the comfort and convenience of everyone. The multi-touch feature allows up to 12 points to be drawn at once. Operation and use are enhanced by two modes: Single mode and Multi mode. The modes can be easily switched from the menu screen. * Multi mode: Allows up to 12 points to be drawn at once. However, operation by gestures is not possible.